11/24/15 Goodbye To Pig Slaughter - Listen To Your Heart, Not Habits! Slaughter is the most brutal act of man in relation to an animal, but it has been popularized in Croatia as the occasion for entertainment and joy. 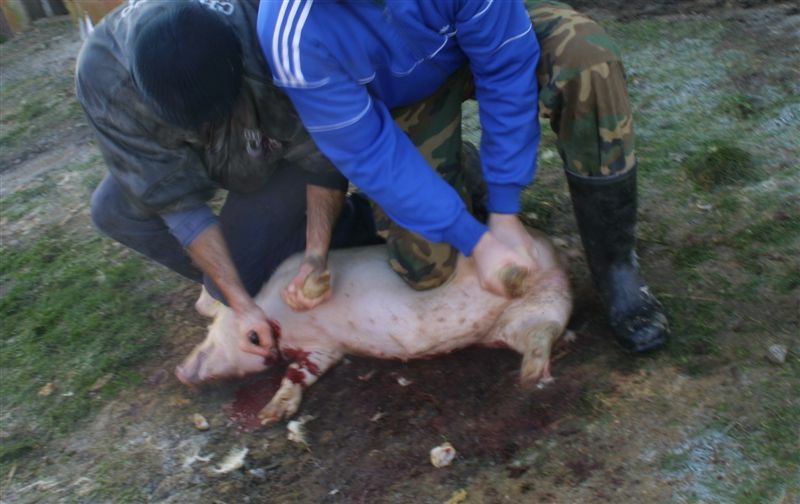 Slaughter of a living being is often humorously depicted by a half-slaughtered pig being caught around a bloody yard. 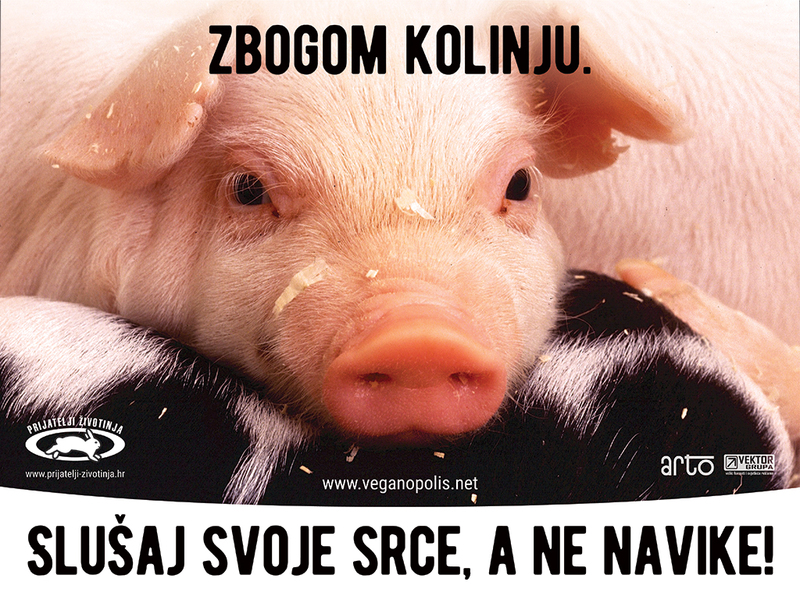 Association Animal Friends highlights that we, as individuals, should face the fact that shedding the blood of animals is a barbaric, brutal, and entirely unnecessary act in the 21st century and, that "kolinje" (traditional pig slaughter) is a shameful custom, which should be left where it belongs – to the distant past! It is well-known that eating animals is not a necessity, but a bad habit, which, ineffectively, tends to be justified in many ways. Therefore, Animal Friends invoke for choice, on the new billboards, i.e. they warrant that we should listen to our hearts instead of our habits, so that we can say goodbye to both slaughter and death. Pigs are very sociable, affectionate, and sensitive animals, whose high intelligence astounds the scientists. They dream, recognize their own names, have a long-term memory and such a complex social behaviour, that was earlier noticed only in apemen. So as to point at their resemblance to dogs, whom we cannot imagine as meat halves and steaks in the plate, Animal Friends, in cooperation with Mercy For Animals, have also prepared a short movie called "Pigs as Dogs", which is possible to watch at www.prijatelji-zivotinja.hr. It is completely clear that pigs, when being slaughtered, feel the pain equally intense as dogs and people, and that they equally want to survive. When we become indifferent towards the suffering of other living beings, and lose compassion towards the animal life, we also lose respect towards the human life. In Croatia, according to the Animal Protection Act, pigs are left to their "owners" during both stunning and slaughter, given that it is not a prescribed obligation of the professional stuff, nor the control. Thus, the already painful scene of the pig killing looks even more brutal and agonizing for the terrified animal. Slaughters are especially cruel because the blood shedding and the extinction of life are being advocated as the joyful gatherings, instead of being ashamed of the brutal taking of the innocent lives. There is no such thing as a humane slaughter, and, in the ethically-advanced society, we should strive towards compassion and a non-violent diet. In abundance of the plant-based foods, it is ethically impermissible to cause the countless screams of dying animals and consume their remains. Hence, the Animal Friends invite the citizens not to participate in living beings' slaughter, but to think about switching to veganism as an ethical and ecologically more friendly diet, which is also proved to be a considerably healthier alternative. More information about plant-based diet and Vege Challenge can be found at www.veganopolis.net .